M.E. Waters a/k/a Mary Elizabeth Waters, is an author, speaker, consultant. She received her master's degree in business management from National-Louis University. She is a business etiquette consultant to new Christian recording artists. Ms. Waters is originally from Charleston, South Carolina, where she learned business skills and how to deal with people from her grandmother, 'Big Lizzy.' Also, she learned business skills and received guidance and inspiration from Precola DeVore, owner of Precola DeVore Modeling Agency and Charm School, Washington, D.C., and her sister, Ophelia DeVore, Grace Del Marco Modeling Agency, New York. They encouraged her to write her first children's book. She began to write women's business books after being inspired by authors such as Maya Angelou and Terry McMillan. She started writing in high school with small articles for the school paper. Later, she started writing books after one of her college professors called her out in front of the class to say that 'she has a unique style of writing and that she should continue in this field.' Ms. Waters self-published her first book, 'The Little Red Blanket,' a multicultural book which introduces children to the homeliness issues. Though she was only homeless for a few weeks after her house burned down, that experience enabled her to identify with this issue. She wrote the book in hopes to heighten the awareness of homelessness in this country and to give something back to her community. 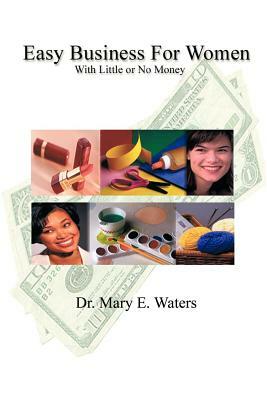 Her most recent book, 'Easy Business for Women with Little or No Money,' explains how easy it is to start and run your home-based craft or art-related business. It is chosen as the official textbook for the Women's Art Business Center. The book is also recommended for men. She recalls getting up at 4 a.m., to drag herself to the computer for about an hour, then out the door for work at 7:30. Ms. Waters has an agent now to help manage her career and get the work out to her readers. She is an active member of the American Society for Training and Development, National Craft Association, Association of Image Consultants International, and the National Academy of Recording Arts & Sciences, Inc.
Tell us how much you like M.E. Waters.